Down comforters wear their name well and are a must have for bedding comfort. Why do all beds deserve duvets (aka comforter)? Because you and your loved ones deserve it and the benefits are delightful. The differences from one down comforter to another may mean the difference between you being absolutely delighted with your purchase or leaving you to wonder what all the talk of delights is about. Take the time to get familiar with the terms below and consider what the best options are for your personal needs. Duck or Goose Down Fill? With the exception of Eider down the quality of goose down out weights that of duck. Goose down has bigger and thicker clusters and does not have the odor sometimes associated with duck. Sometimes bedding is marketed as pure down. 100 % down is practically impossible so be cautious of any product that claims so on their label. What they really mean is that all of the goose feathers and down are pure. Usually labels contain a “no less than” amount (ie. 75%) of down contained in the particular down bedding product. The remainder of volume is feathers, mostly small or very small, but feathers none the less. A rating of 80 – 85% down is a high quality product. The quantity of down and feathers found in down bedding is measured in ounces. The sizes of down filled blankets, down comforters and bedding are not standardized and are different depending on the manufacturers, so it's important to measure and double check the sizes before purchasing. A queen sized down comforter may not necessarily be the best size for your queen sized bed. The blanket dimensions are almost always included in the product description so make the time to take your measurements. All down that has met the American and Canadian labeling standards goes through a rigorous sorting, cleaning and sterilization process. Down bedding labeled as hypoallergenic have been ultra cleaned. Two tests are conducted (1) an oxygen test to measure the organic matter left after having been washed and (2) a turbidity test to measure suspended solids in the material used to make the bedding. What's important to look for is an oxygen rating of 10 or less. A turbidity rating of 450 or more indicates a good quality. Allergy suffers should look for products in this range or better. A low turbidity rating of 100 or less is of poor quality and should be avoided. Measures how many cubic inches of the product are covered by one ounce of down under specific laboratory conditions. Simply put, it measures the puffiness of a down comforter or bedding product. The puffier the down bedding is, the better it isolates, and the price increases accordingly. An 800 fill goose down duvet or comforter will keep you toasty and warm even in the coldest temperatures. 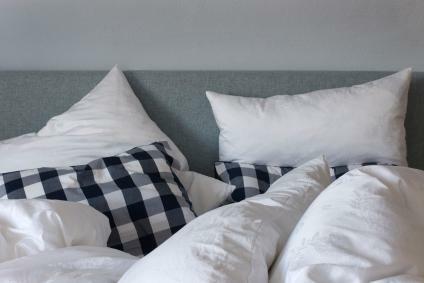 If you are looking for a slightly cooler bedding opt for a high fill power but with a smaller quantity of down fill, BUT if you are a very warm sleeper regardless of the room temperature go with a lower fill power and put your dollars saved towards other quality options that better suit your needs. Traditional or Baffling? This refers to how the down comforter, duvet, or feather bed is sewn together. Traditional means that the both sides of the fabric are sewn together from end to end and side to side creating a box pattern or with a double diamond pattern preventing the down from shifting and therefore eliminating cold spots. Some brands offer double stitching for extra reinforcement. Less expensive than baffling makes them great for down lovers on a budget or for the guest room. Baffling means that vertical walls of fabric are sewn through the bedding creating individual channels or boxes. Baffling makes the down comforter more durable adding years of use to the product but more importantly it allows more room for the down to loft giving you a fluffier and cozier blanket. Baffling is more expensive than traditional sewing but the delights out weight the costs. Thread count is the amount of threads found in each square inch of fabric. The higher the thread count number the thinner and softer the fabric will be. It also acts as a barrier to keep the down inside and a barrier to keep dust and mites out. 300 TC is quality fabric and anything over 360 TC is premium quality. Cambric and Egyptian cotton are of exceptional quality because the fabric has gone through a compression process that fills all the invisible spaces between threads. Both are sensible and desired fabric for down bedding because very little, if any, down will ever poke through. For more on the benefits of down comforters and comforter duvets check out What is a Duvet? Return from this Down Comforters page to the Down Bedding Delights home page.